Premium Cotton flairy dress with both side pleats making flair with doris and handmade tussles with pearls. Front placket with designer buttons. Sleeves with beautiful pleated flair. Color - Dusty Green Length - 47" Sleeves - 17"
Premium rayon slub A line kurta with designer geomatrical print combined with parellel golden handblock print. Bell flair sleeves. Sides closed, Designer buttons with golden color multiple coin hangings on placket. Length 47" Sleeves 17"
Premium quality rayon slub straight kurta with beautiful cross stitch embroidery flowers on all over front and sleeves. 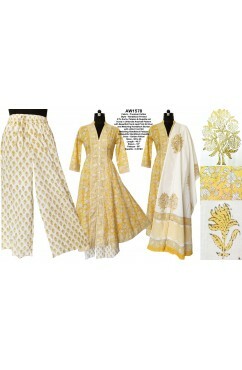 Length - 47" Sleeves - 17"
Premium quality rayon slub huge flair Anarkali kurta with very sober & cute print. 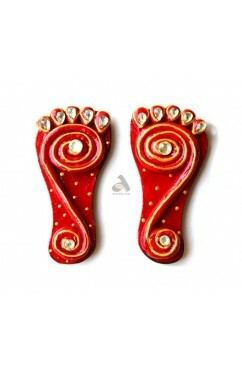 Front yoke in Machine katha fabric with small size ethnic print boota with sequence work and diamond buttons. Fabric also put inside bottom flair giving it a good fall n bounce. 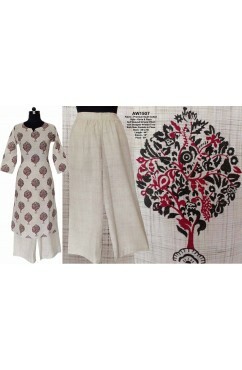 Color - White with blue print Length - 51" Sleeves - 17"
Premium cotton beautiful discharge print Kurta with one side pocket. Detailing done with red trims on sleeves and front placket by putting fabric triangles. 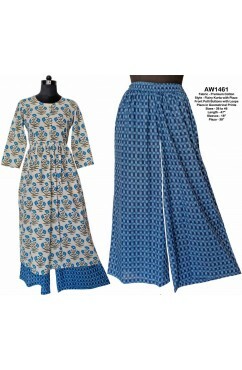 Length 46" Sleeves 17"
Premium quality very soft rayon with color threads in weaving. Long umbrella flair dress with three types of fabrics used. Front top handmade potli buttons. Color Purple Length 52" Sleeves 17.5"
Premium quality rayon slub straight kurta in solid colors with coconut buttons in placket and sleeves loops. Color - Brick, Mustard, Grey Length - 44" Sleeves - 17"
Premium cotton beautiful HAND AJRAKH huge flair Anarkali Kurta, combined with solid blue fabric with Matching ajrakh border on front & back, bottom border & sleeves with front Dori with red pom pom tussles. Length 46" Sleeves 17"
Premium quality south cotton Kurta & plazo set in self weaved stripes effect with beautiful designer printed tree. Both side pockets in Plazo. 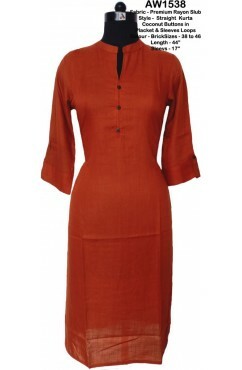 Length 44" Sleeves 18" Plazo 39"
Premium quality cotton flex kurta with designer crosses print and designer wooden buttons on placket. One side pocket. Color - Brown with mustard print Length - 47" Sleeves - 18"
Premium rayon slub beautiful Kurti with heavy pink embroidered yoke on front and sleeves also heavily embroidered. Front Dori with beads tussles. Front little gathers below the yoke. 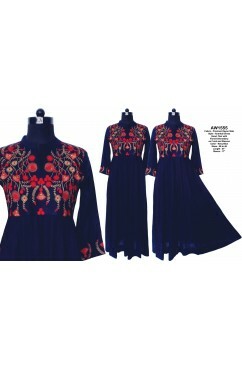 Sides closed, Sizes 38 to 46 Length - 46" Sleeves - 17"
Premium rayon slub beautiful blue anarkali dress in good flair with beautiful heavy red color floral embroidery on front and on sleevss. Color - Navy Blue Length - 51" Sleeves - 17.5"
Premium cotton double toned fabric in silk looks with front crosss stitch embroidery all over. Color - Green+Yellow & Pink+orange Length - 45" Sleeves - 17"
Premium quality rayon slub straight kurta with beautiful zig zag print in sides and middke panel with beautiful mughal print boota. 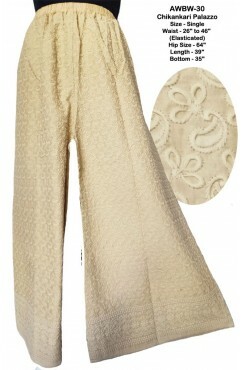 Front tiny potli buttons in white color. 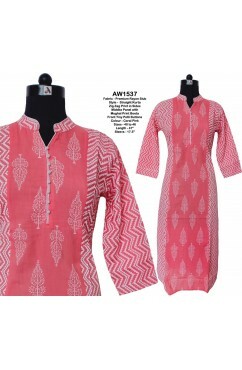 Color - Coral Pink Length - 47" Sleeves - 17.5"
Premium cotton long straight kurta in beautiful mughal print. 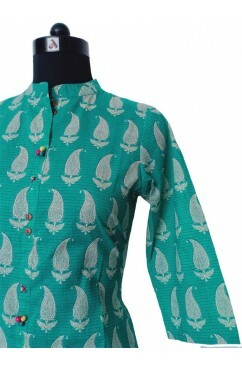 Handwork of colorful beads & thread with metal buttons on placket. Colors : Rama Green, Pink, Orange Length 47" Sleeves 17"
Premium quality beautiful floral block print kurti with short sleeves. Front middle wooden colorful birds. One side pocket. 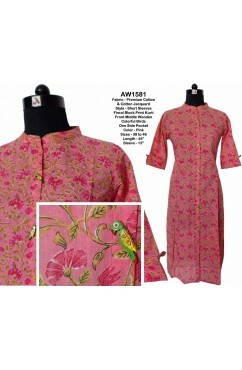 Color: Pink / Purple Length 45" Sleeves 13"
Premium quality cotton flairy kurta with plazo in beautiful contrast prints. front beautiful potli buttons with loops. Plazo in geometrical prints. Length Kurta 47" Sleeves 18" Plazo. 38"